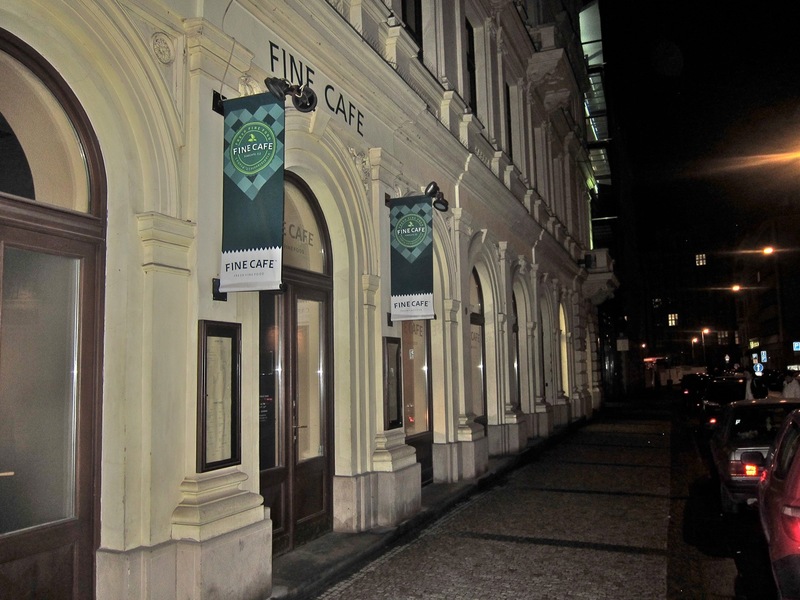 I've been watching Prague's restaurant scene for more than 10 years. I've seen chefs come. I've seen them go. I've seen them come back. I've watched restaurant locations that fail. And fail. And then succeed. The most recent example of this is the return of chef Jean-Paul Manzac with his opening of Bistrot M at La Boucherie Moderne in Smíchov. 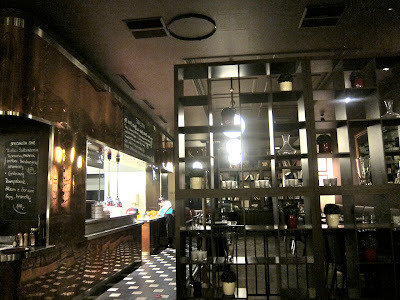 His return reminded me of the location for his previous effort, Brasserie M, which I wrote about back in 2007. A great deal was invested in fitting out that restaurant with an ultra-modern, open kitchen, custom-made furniture, and interesting copper accents. That restaurant closed and was replaced by the unremarkable Fama Grand. 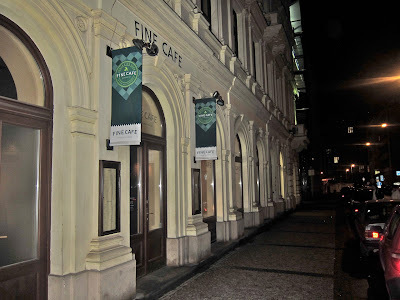 Now it has been replaced by the more remarkable Fine Café. It is in a somewhat isolated location, not far from Tesco on Národní. The massive construction and diversion of foot traffic caused by the nearby metro station construction can't help things. But a glance at Fine Café's enticing and creative online menu inspired me to return once again to this spot. The inside is not dramatically different than it was during the Brasserie M days. The high ceilings, wood flooring, shiny copper, and bright kitchen are all still there. If you look carefully you can see the wrought iron in the tables and railings still say "Brasserie M."
The smoking area is up front. The nonsmoking section is the slightly raised area across from the kitchen. 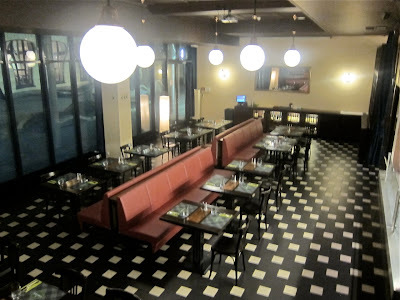 There's a large open dining room in the back that is suitable for parties. The sound system played a rather unpleasant type of techno. 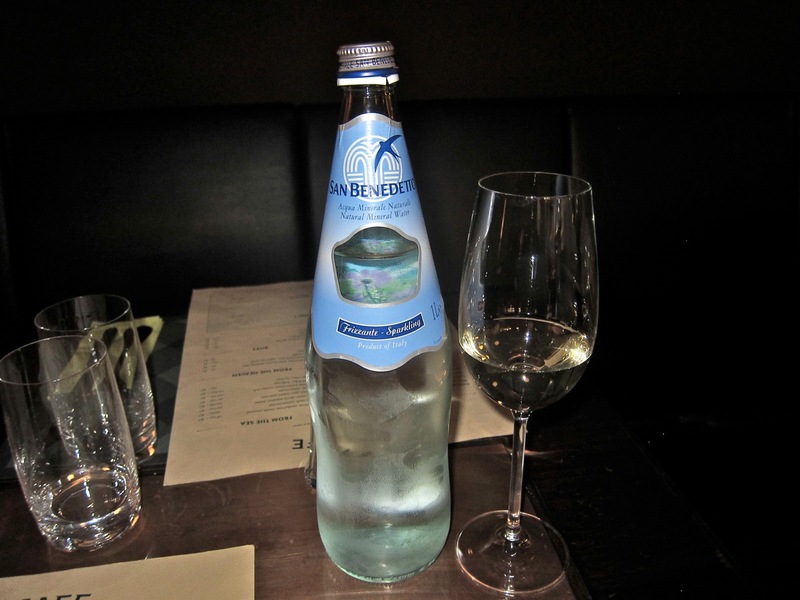 I drank a very pleasant Pinot Grigio (62 CZK/.1 liter). My friend enjoyed fine and more equitably priced Merlot (28 CZK/.1 liter). One thing I like about Fine Café's menu is that everything is available in half portions. It is easier and cheaper to sample a number of different dishes. 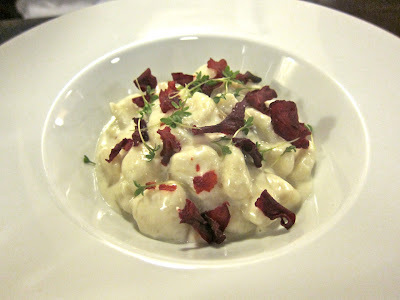 We started off ordering the ricotta gnocchetti. (165 CZK/small). We both thought this was lovely. 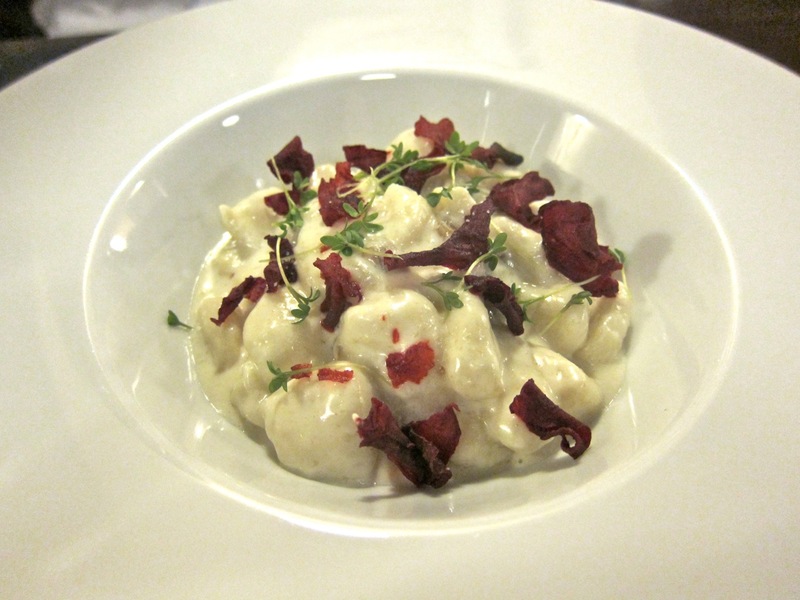 The gnocchetti were ethereally light, sitting under a smooth, balanced cream sauce. Under that were lightly crunchy pieces of chestnut. Dried beetroot added another contrast of flavor and texture. The fresh herbs were a nice touch. 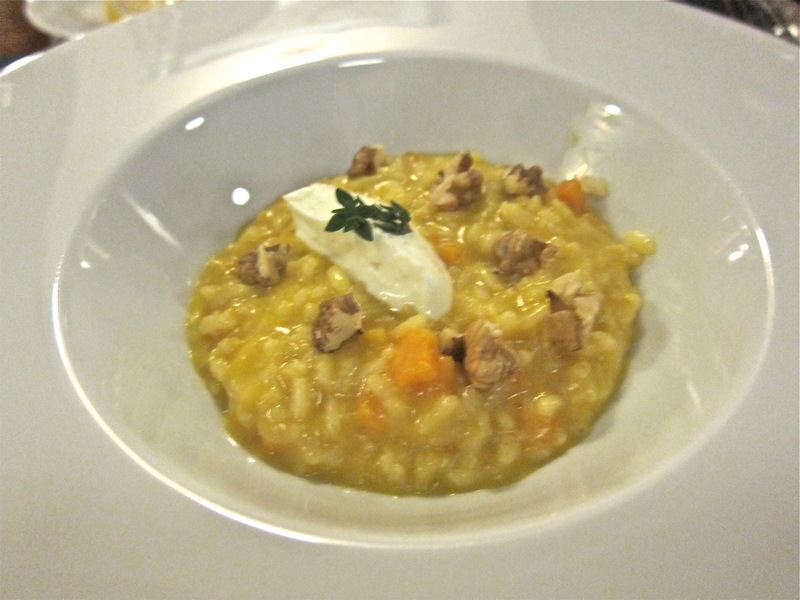 Another choice in the "From the Garden" section was the pumpkin risotto (85 CZK/small). The lightly sweet rice was overcooked by my standard, but tasted very good. It was studded with walnuts and pumpkin chunks, and topped with a dollop of goat creamy goat cheese. Even the small portion felt substantial and filling. The next menu to sample was "From the Sea." 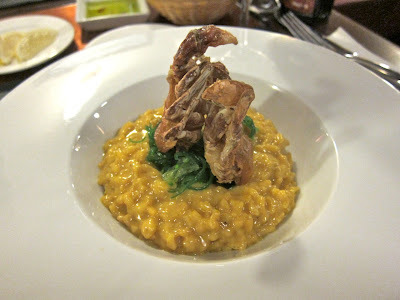 I got the soft-shell crab with saffron risotto (195 CZK/large). The crab was fresh and properly fried to a light crispy texture. There was just one problem. It was far too salty for me. The risotto was again too soft, but tasted fine. I didn't pick up too much of the saffron flavor. Actually, there was a second problem. I told the waitress I wanted small portions of everything. I even repeated it in Czech. When it was delivered, the crab portion looked large, so I asked about it. "What size portion of crab is that?" I asked. "That's a large portion," she replied. "But I ordered all small dishes." "No, you didn't. You ordered a large." I always appreciate it when told that my memory of very recent events diverges sharply from reality. Thankfully, there are plenty of servers in this town willing to help me with this. "From the Land" we ordered the pork tenderloin (155 CZK/small). The silky, tender meat was cooked to medium, which I consider perfect. I do not fear pink pork. Freshly diced apple was on the side, and it all was placed on a smooth pumpkin puree. A rich demi-glace was poured on top tableside. We both considered this dish the hit of the night and something worth returning for. 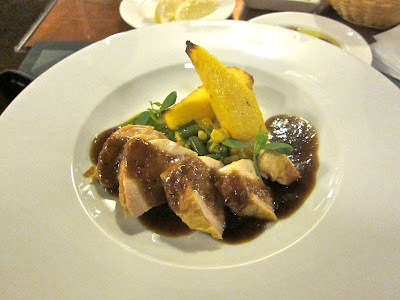 I ordered the corn-fed chicken with pistachio pesto and polenta (125 CZK/small). Again, the meat was amazingly tender. It reminded me dishes that I'd had cooked sous-vide (under vacuum) that give meat similar qualities. 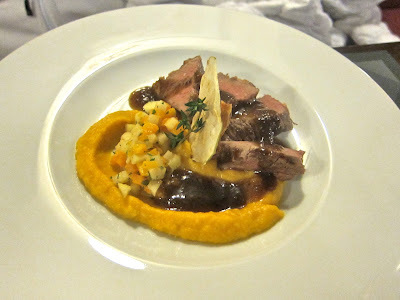 The warm polenta was excellent, with a great corn flavor and delicate texture. It was topped with a rich sauce like that on the pork. It was a very reasonable amount of food for the price. The bill for this meal, which included two .2 liter glass of wine came to 1117 CZK before tip. We were very full and thought it was very fair for how much we ate. I returned a week later with another friend. 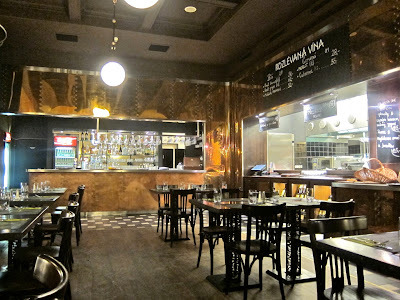 JK had the Jerusalem artichoke soup (55 CZK/small). 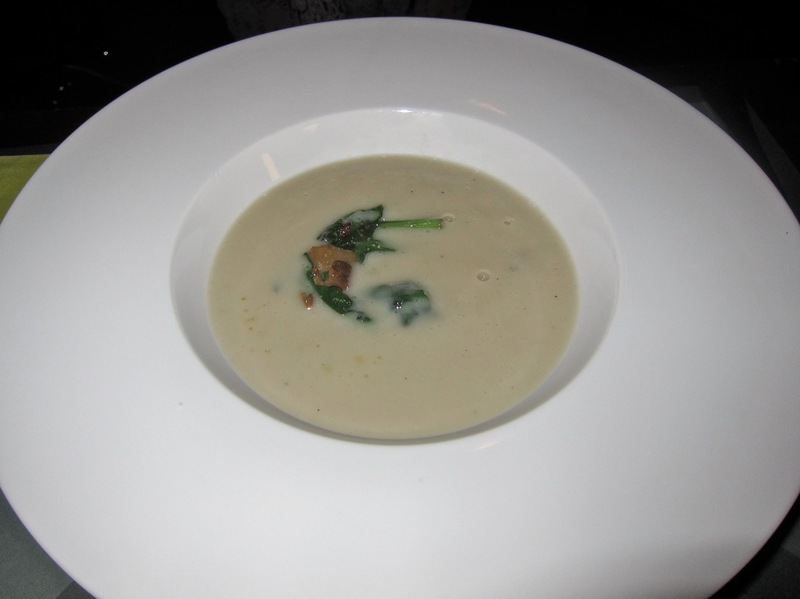 The creamy soup was poured over sauteed spinach and mushrooms in the bowl. The subtle flavor of the mushroom came to the surface. She liked it a lot. I thought it was good, though not as rich and perfect as a version I once had at Chagall's Club. I went for the beef tartare (175 CZK). The meat by itself was rather bland. 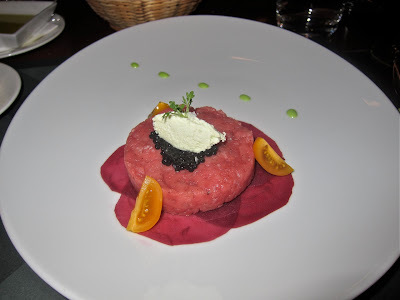 But it was topped with avruga caviar and an almost butter-like sour cream mixed with wasabi. It sat on top of very thinly-slice beets, which gave it an earthy tone we liked. Mixed together on bread, it was OK, but it took a while to get the flavor proportions right. I'd probably not order it again, though. 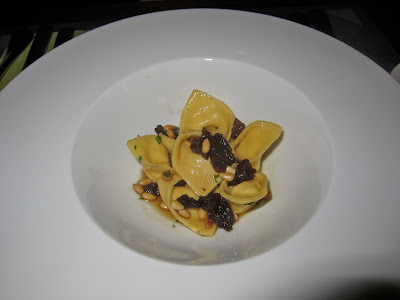 JK was interested in the goat cheese ravioli with raisins and maple syrup (85 CZK/small). This she loved. The ravioli were al dente and had a small amount of tangy cheese inside. There were crunchy pine nuts along with the raisins. The dish was somewhat overwhelmed by the syrup. I liked it, but you need to know what kind of sweetness you are getting into here. It could easily be a dessert. 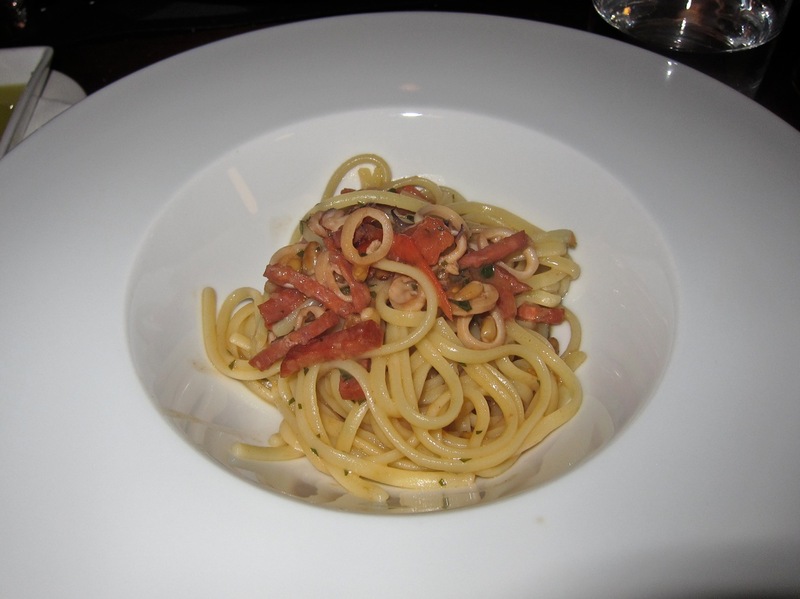 I ordered the linguini with squid, spicy salami, and pine nuts (105 CZK/small). While the overall flavor was fine and the pasta was properly cooked, I found this dish disappointing. The calamari rings were the smallest I have ever seen. They were microscopic and rubbery. 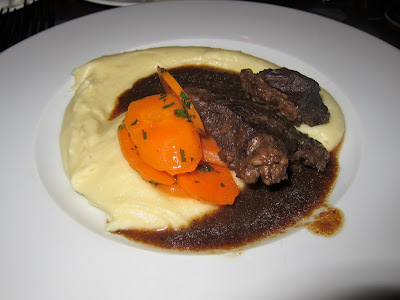 I tried the veal cheeks (155 CZK/small). The meat came apart easily on the fork, with a beautifully savory sauce. JK was put off by a thick piece of fat. I liked the fat. The maple syrup carrots not as sweet as I feared. It came with a side of smoked mashed potatoes, which were creamy, but not as smoky as I expected. 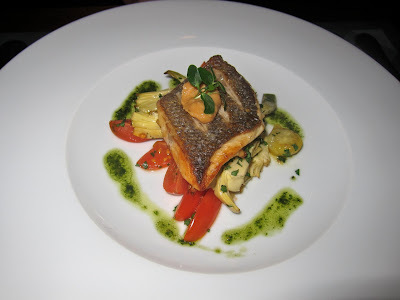 JK had the sea bass with artichokes and chili jam (170 CZK/small). The boneless fillet was small but fresh, with a crispy skin. We both went for dessert. 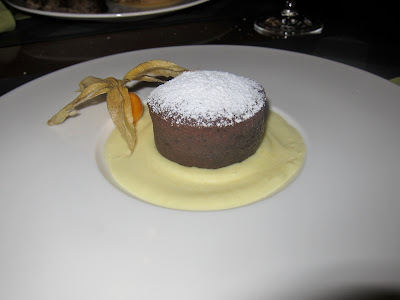 I had the chocolate souffle, which was really more like a fondant (105 CZK). It had an intense and top-quality liquid chocolate center. It rested on a fairly average vanilla cream, but the chocolate more than made up for it. JK had the banana bread (78 CZK). 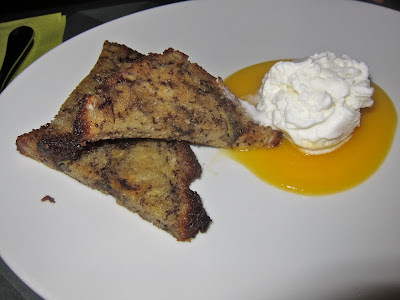 I admit, I had low expectations, but it was the best banana bread I've ever had. It was served warm, with a bit of crispness to it, and sat next to a pool of peach sauce. On that was a very refreshing frozen yogurt. A surprising winner. The bill for this second large feast was 1271 CZK. I thought it would be more, considering all the food we had. My overall feeling is that the value and quality at Fine Café more than make up for its imperfections. Yes, the service was inept at times. But it was also mostly friendly. I was told by JK that "the ladies room smelled like a men's room." From my point of view, the lights are too bright and that, along with the poor music choices hurt the atmosphere. I think the name of the place itself is bland and doesn't clearly evoke what kind of restaurant this is. I take no pleasure in criticizing these small things. The food is what counts to me, and I would like to see this place succeed. This type of cooking, especially at these price points, needs to be nurtured. We left both times feeling like it was a good deal for a good meal. That is a very fine thing, indeed.